locate a job in a career field which they have a desire to learn more about. build a relationship with an adult leader in the community with interests similar to their own. have the opportunity to “preview” a career choice. 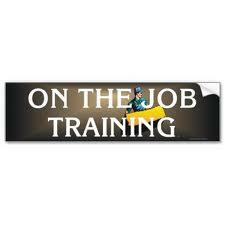 Jobs must be within a reasonable distance of school so that you can maximize your time with the training experience. You should be able to get to your job or back safely within 10-12 minutes. Students must go to their job every day with the exceptions listed on the contract and below. Students must go directly to their job as soon as safely possible and must return directly back to school to check in with Mrs. Johnson prior to 11:01 on regular school days and by 12:20 on late start days. You are not to make side trips on your way to or from work for any reason and should not leave work earlier than necessary. There will be an on-line component to OJT that requires you to log on and respond weekly. o To receive full credit for on-line assignments students must type in complete Standard English sentences and adequately answer all of the questions posed in the lesson assignments. o Provide the reasoning and relevance to the answers to the questions when giving personal examples. o Open lab passes may be requested to work on the on-line questions. Be self-disciplined and manage time wisely in order to ensure success. Parent permission form MUST be signed and returned before you will be allowed to leave the building. You are representing MCC while you are out in the community, please do it with pride. MCC School Handbook guidelines still apply while you are out of the building. Students will receive one warning before failing the class. I will make spot checks with your employer. The first time I check and you are not there when you should be will be a warning. This includes failure to call in when sick. The second time you will earn a failing grade for the class. Students must abide by all traffic rules and wear a seat belt at all times when traveling to and from work. No one else is to ride with you. Students must walk to work if your job is within three block of the school. Students must call their employer no later than 9:00 am if they are ill and will not be coming to work that day. Failure to call in is a no call/no show and will result in a warning or a failing grade if you have already received one warning. Snow days, holidays, or vacation days: Students are not expected to go to work on snow days, holidays, or vacation days. Scheduled days off for this quarter are February 15 (make-up snow day) and 18. Sick Days: Students are expected to call their employer, with adequate notice as stated above, on any day they will be absent due to illness. Class hours are from 9:34-11:01. Students should arrive at work as soon as possible and not leave any earlier than necessary to get back to school by 11:01. On TNT days and late start days, class meets from 11:15- 12:20 so attendance and time requirements will be adjusted accordingly. TNT days for this quarter are February 4 and March 4. Go to work prepared and be ready to begin as soon as you arrive. Respect the physical environment and take care of it. Use learning outcomes to set personal learning goals and demonstrate mastery. Be engaged in what you are doing and complete work on time. Provide feedback through the on-line system. Let me know how things are going. Look for ways to relate the content to your own life. Actively make meaning by examining what you are doing, connecting ideas, and problem solving. Let me know if things are not going well. Ask for help if needed, try, and persevere. Observe, listen, take notes, and practice. Reflect, retry, and refine your performance. Use feedback to improve your learning. Respect yourself as well as your employer, community members, all students and staff. Take direction and constructive criticism without resentment and without making excuses. Everyone makes mistakes and so will you. Learn from your mistakes. Be neat, clean and appropriately dressed for the business where you are mentoring. On every job there are some duties that are more appealing than others. Accept all requests without complaining and without slowing down. Work willingly and enthusiastically. Remember, a positive attitude is contagious.